Death By Chocolate Productions presents a Pirate Festival! There will be some very nice prizes awarded for categories like 'best original score', 'best stagecraft', 'best music set', and 'best pirate band'. As mentioned, the event theme will be pirates. 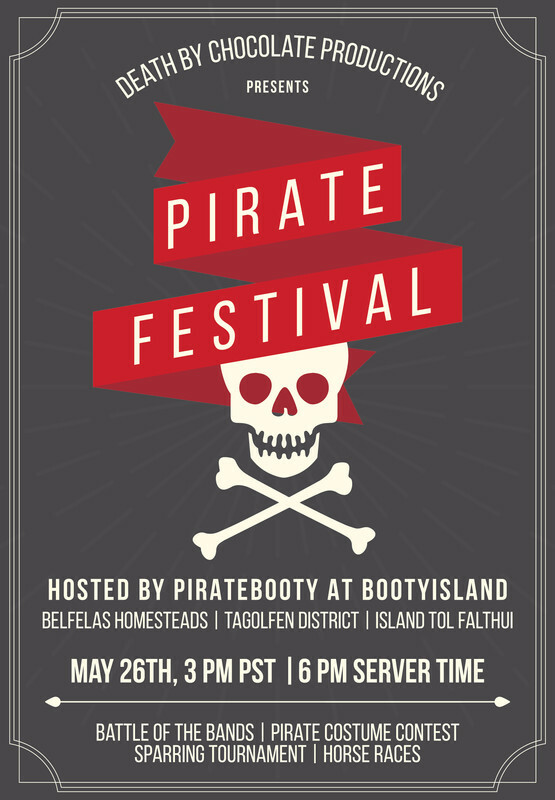 We will also be running Horse Races and a sparring contest on the island of Tol Pthui in Belfalas Homesteads as part of this event, among other smaller events such as fishing and hide and seek. The island is large. Prizes for events include a variety of End-game items that are in high demand or difficult to get! So come have fun! PLEASE SEND IN-GAME MAIL to BEORAN if you are interested in participating or otherwise wishing to help. Thank you from Death by Chocolate! Last edited by Nairobe; May 03 2018 at 02:41 AM.